Method createConfig takes options object, dynamically construct config object and returns it back to client. Maybe it is the best example, but shows - I dynamically able to construct an object, just putting new properties into it. Now, let’s try to do that same with C#. Believe me or not, but I can do exactly (OK, mostly exactly) code with C#. Dynamic would tell to compiler - “Do not check my type now, let Runtime do that”. So, with dynamic objects you can do obj.MyProp, compiler would allow this code, existence of property would be checked on runtime, if absent - exception will be thrown. ExpandoObject is a super-power of .NET, allows you to construct object at runtime. You can see, that I just assign new property, that property would be dynamically added to config object. Life would not be so interesting if every thing is so easy. My first implementation failed to work, in line if (option.Ip || option.Proto) then I called createConfig with object that actually contains no such properties. 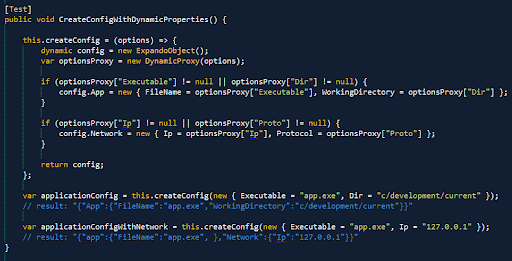 As I said above, dynamic simply throws an exception if property is missing. I could wrap code in some try / catch cases, but it would be to ugly and magic would gone. We have to extend our magic formula with one component - Reflection. So, let’s pronounce spell again, “anonymous types + dynamic + ExtendoObject + Reflection” and check out final secret piece of code. DynamicProxy is simple wrapper around the dynamic, it overloads  operator and check availability of property using Reflection.